This book is based on the inaugural Jordan Lecture Comparative Religion in 1951 and offers a survey of religious movements in India, past and present. 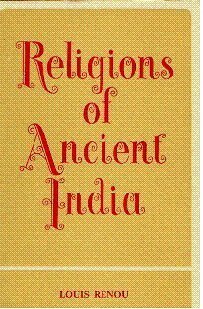 Renou discusses the Veda, its rise and fall, and the state of studies of Vedic ritual, liturgy, mythology, magic, speculative thought, and secular discipline; the contribution of Vedic Upanishads to Hinduism; the Mahabharata; the expansion of Hinduism, its fertility and battle myths, eroticism, legends of the gods, cosmogonic speculations, and theories of transmigration and 'liberation'; its doctrine of meditation and exercises of Yoga; Hinduism's mosaic of sects and independent groups and their attitude to the caste system. The volume concludes with a presentation on Jainism, the ascetic, non-violent sect that has adapted to modern society. Louis Renou was Professor of Sanskrit and Indian Literature at the Sorbonne, France. Welcome to The Warm Springs Book Company -Booksellers since 1987! ******** We are an internet bookstore featuring new, used, and collectible books. ******** We accurately describe our books and are prompt in processing and shipping all orders. ******** Books with dust jackets are protected with clear plastic covers. All books are securely packed to protect them during shipment. ********* To ensure that our books will meet your expectations, please e-mail or telephone us if you have any questions regarding the contents or condition of any of our books. Books are shipped promptly on receipt of payment. Individual items are shipped by media mail for $3.95. Additional items are $2.00 each. shipping are sent at cost. Please contact us regarding costs. All domestic orders over $20.00 are sent with delivery confirmation. Insurance is recommended on collectible or rare items. We ship by Priority Mail Flat Rate Envelope whenever possible (if the books fit in the envelope without incurring damage during transit) at $24.95 for most countries except for Canada and Mexico which ship at $21.95 for a flat rate envelope. Oversized books, book sets, and heavier books that do not fit into a flat rate envelope will require additional postage. Costs for shipping by regular (non flat rate envelope) priority mail or express mail are determined on a order-by-order basis depending on the weight of the book(s) and the destination country.